Grab a good seat and don't look away from the stage, for The Great Vorelli (Bryant Haliday) is about to dazzle London with his eerie mixture of hypnotism and ventriloquism. However, there may be something a little too lifelike about his dummy, Hugo, who has the ability to walk across the stage all by himself. Now Vorelli has become obsessed with Marianne (Yvonne Romain), an heiress who proves to be the key to the powerful mesmerist's insidious plans. Marianne's boyfriend, reporter Mark English (William Sylvester), suspects evil at work and becomes determined to uncover the secret, terrifying link between Vorelli and the wooden Hugo, a creature born from your darkest nightmares! 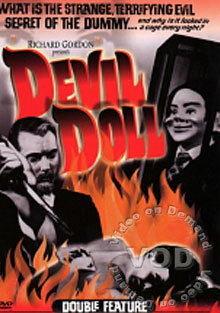 Experience the haunting imagery and unforgettable twist ending of Devil Doll, the cult horror classic from producer Richard Gordon, which has chilled audiences for decades. Hailed as "tense and terrifying all the way" (The Dark Side) and "genuinely eerie" (Shivers), this gem of psychological suspense and supernatural thrills can now be enjoyed in a dazzling new transfer - so little Hugo can reach out and shock you like never before!